After escaping the Forge and the murderous clutches of Nimrod, the Doctor and Evelyn have things to talk about. 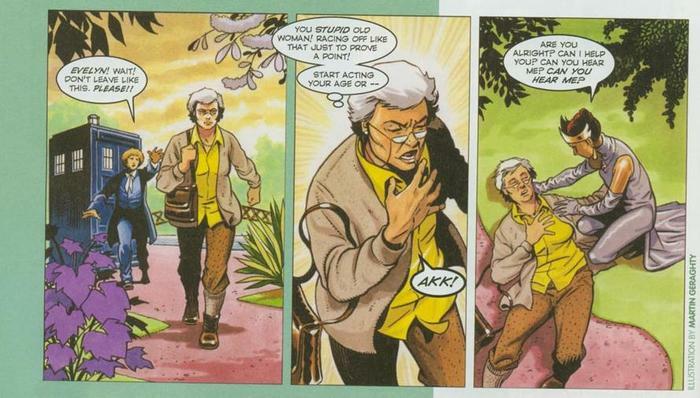 The Doctor’s attitude towards death is a subject that these days is too close to Evelyn’s heart, and eventually she demands to be set down somewhere where she can be free of him for a while. And so they come to Világ, where the Doctor’s meddling lands him in the middle of a truly dangerous liaison and Evelyn meets a man who wants to change the course of her life forever. 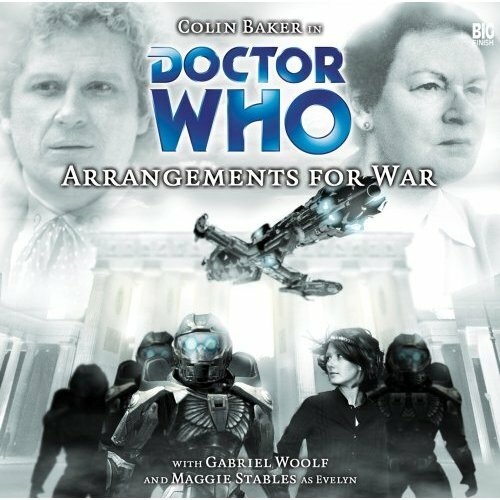 Colin Baker is the Doctor in Arrangements for War. I was a fan of Linkin Park once. Don’t hold it against me, it was the early 2000’s. Even as I cringe slightly at thinking of their music and lyrics now, one line has always stuck with me through the years. “Even the people who never frown eventually break down.” Some people pride themselves on being able to take anything that life throws at them, handling it all with a stoic manner and a small grin, or a simple shrug before they go about their business. More often than not, however, the mental weight and worries pile up on their shoulders, higher and higher until the whole thing collapses like a Jenga tower and the individual crumbles under the pressures of life. Over his 900 years, the Doctor has experienced his share of death, destruction, and desolation. Classic serials such as Inferno and Warriors of the Deep, as well as the Time War, have seen the Doctor watch helplessly as everyone around him died, despite his best efforts. Sometimes, a smile and a reassuring word would be all the acknowledgment the Doctor would give of his failures. Sometimes, he would completely ignore what happened, preferring to put it all behind him and move on to a new location and a new adventure. Very rarely has the viewer seen the Doctor completely broken; The Night of the Doctor is one of the few examples, where the Eighth Doctor realizes he isn’t built for the Time War and regenerates into the War Doctor. From a companion’s point of view, the Doctor’s response to these experiences can come off as cold and detached. The viewer knows that the Doctor cares about all creatures great and small, and that as Time’s Champion he’s dedicated his lives to protecting life across the universe. But companions, who see the Doctor as an all-powerful being who always wins, sometimes are confused by his reaction, or rather non-reaction, when he loses or knows he can’t do anything to help. So, what happens when a companion calls the Doctor out on it? And how should the companion react when the Doctor doesn’t seem to care? Arrangements for War sees the Sixth Doctor and Evelyn Smythe in this exact situation. A serial that’s light on action but very heavy on plot, it attempts to find an answer to the above questions. A script full of twists and turns, full of strong performances by most of the cast, Arrangements for War suffers from a few plotting hiccups, but they don’t detract from the overall power of the story. After the death of Cassie in Project: Lazarus, Evelyn is upset with how nonplussed the Doctor seemed at their friend’s passing. She demands that the Doctor take her someplace where she can be alone to think; no adventures, no days needing to be saved, no need to interfere. The Doctor has the perfect place; the planet Vilag. The countries of Galen and Malendia are about to end centuries of warfare via a diplomatic marriage. A few weeks after the marriage, the planet will be invaded by an alien race known at the Killorans, but the newly formed Kingdom Alliance will drive them back. Until then, Evelyn can visit Valig without pressure, without worry. To the Doctor, she just needs time alone. To Evelyn, she needs to consider where or not she wants to continue traveling with the Doctor. But the Doctor’s very presence causes the engagement to fall through, and against their wishes, the Doctor and Evelyn find themselves on opposite sides, trying to reconcile the two nations before the alien invasion. With forces aligning against them, can the two bring peace before the arrival of war? And even if the day is saved, will Evelyn still wish to travel with the Doctor? Paul Sutton picks up the narrative thread that winds from Jubilee, Doctor Who the Pirates, and Project: Lazarus. He’ll go on from here as the writer of several Doctor Who audios, including this story’s sequel Thicker Than Water. For his freshman work with Big Finish, Sutton does a very good job. He uses several plot devices to outline the situation on Valig, mixing in character driven scenes with news reports and time skips to bring the listener up to speed without heavy-handed exposition. Doing so allows Sutton to devote more runtime to fleshing out the characters and their interactions. Make no mistake, Arrangements for War is a character driven piece. There are moments of action, but Sutton focuses on the interactions between characters to move the story forward. If there’s one thing the Sixth Doctor has in spades, it’s his belief in his abilities. While his TV appearances have been full of bluster and ego, the audios for the Sixth Doctor have shown a more polished Time Lord, one that isn’t as sharp or thorny as his interactions with Peri would show. And if there’s one actor who’s managed to sand the rough edges away to give us a Doctor bursting with bravado and self-confidence without coming off with…well, TOO much pomp, it’s Colin Baker, who has yet to turn in a sub-par audio performance. Arrangements for War presents us with a different Doctor, however. From the opening scene, the Doctor wavers, unsure of what do with Evelyn and how to approach her. He stumbles over his words, throws out several half-hearted ideas, and finds himself alone and, dare I say, depressed as Evelyn wanders off on her own. In The Wormery, the Doctor found himself seeking answers at the bottom of a bottle for a brief period of time, before his sense of adventure kicked in and he and Iris saved the day once again. Here, however, his attempts to do absolutely nothing to interfere backfire in spectacular fashion as a few quiet words fill a young soldier with confidence to confess his love and throw the entire diplomatic marriage out the window. For 90% of Arrangements for War’s runtime, we get the Sixth Doctor being charming, being sweet, being cunning, and being menacing, but Baker adds a undercurrent of desperation to all of the Doctor’s actions. The confidence has just a twinge of “this should work…I hope.” As the situation gets more and more desperate and the Doctor finds himself catching up more than he calls the plays, Baker portrays that sense of urgency in a way that engages the listener. And even when it appears to all work out, fate has one final card to play, and that’s when Baker kicks it into overdrive. The final scene of the audio has the Sixth Doctor in full-blown “Time Lord Victorious” mode, and while there is a hint of melodrama in his initial anguished declaration, Baker doesn’t go the “Godhood” route that David Tennant went in The Waters of Mars, instead adopting a “no, no, no, this is wrong, I will fix it” mentality. Very clipped, very all-over-the place, and very gripping. God bless Maggie Stables. Her time as Evelyn is a breath of fresh air, and her departure from the TARDIS is right around the corner as per the events of the upcoming Thicker Than Water. Arrangement for War sets the table for that audio as Evelyn takes a good, long look at her travels with the Doctor. She’s seen the Daleks attack Gallifrey as well as seen a Dalek tortured in an alternate timeline’s English Empire, as well as hearing of a student of hers committing suicide and another young lady she considered a friend die in front of her eyes. For the wonders she has seen, she’s also seen death and destruction. Even when the Doctor promises her time alone, she finds herself thrown headlong into the political situation. Evelyn and the Doctor spend most of their serial apart, and it gives testament to just how great an actor Maggie Stables is that she doesn’t need Colin Baker beside her to make Evelyn so memorable. Not only does she show strength in talking herself into diving off of a moving train so she can make an escape, but when push finally comes to shove and the Sixth Doctor is about to break the laws of time, Evelyn steps up and convinces him that he did everything he could, and that he is a good person…and that, after their time on Vilag, she believes he truly cares, even if he can’t show it in a way she understands. Outside of her time with the Doctor, the listener discovers something about Evelyn touched upon in Project: Lazarus. Evelyn has a heart condition, one that is slowly killing her, and she’s worried if the Doctor will forget her once she’s gone, even after all they’ve experienced. Maggie Stables, after a long career as a French teacher before becoming a stage and audio actor, recently retired from acting due a long-term illness. Knowing that makes her confession to Rossiter all that much more heartbreaking. Speaking of Rossiter, who would imagine that the voice of Sutekh in Pyramids of Mars and the voice of the Creature from The Impossible Planet/The Satan Pit would play a companion’s love interest? Love interests are very hard to pull off in any genre, and Doctor Who tends to use them as a way to write companions off the show in their last serial. As Governor Rossiter, however, Gabriel Woolf manages to play one-half of the best “companion romance” the entire franchise has seen. An experienced politician who misses his wife and children but does his duty because he must, Woolf’s Rossiter is kindred spirit to Evelyn. He fills his performance with that jaded weariness long-time politicians have after the idealism has burned away and pragmatism is all that is left and appreciates Evelyn for her honesty and forthright manner. Even though Evelyn’s story continues past Arrangements for War, I wouldn’t have been surprised if Evelyn did leave the Doctor for Rossiter, and I wouldn’t have written it off as a cheap plot to write Maggie Stables off the show; the chemistry and performances between the two are that convincing! The rest of the supporting cast turn in worthwhile performances, for the most part. Philip Bretherton is the scheming politician opposed to the political marriage, and he serves as the Doctor’s primary adversary, up until he realizes the Killorans (an alien race who play a part in the Bernice Summerfield range of audios) are invading, at which point he changes his tune and uses his abilities to assist in repelling the invasion. Bretherton manages to avoid having his character, Suskind, become a stereotype of the scheming politician archetype, instead making his motivations and actions, extreme as they are, believable. The same, sadly, can’t be said for his right-hand man, Kraig Thornber’s Commander Pokol, who is the standard “do anything” type of “yes man,” who’s repeated appearances draw a weary “Pokol” from both the Doctor and the listeners. With a love story serving as one of the emotional pivots for the story, the chemistry between Princess Krisztina and Corporal Reid has to come off as genuine, or all of the Doctor and Evelyn’s efforts are for naught. Lewis Rae, best known for the brief Channel 4 sitcom Captain Butler and Katarina Olsson, her second serial in a long voice-acting association with Big Finish (she’ll be best known as the Headhunter in the upcoming Eighth Doctor Adventures range) have that chemistry, two longtime, coy, separated lovers who try to be together by any means necessary, no matter who or what conspires to keep them apart. What could have been a pair of one-note characters are given depth and emotional weight, so when their final fates are revealed (in a chronological sense and in a “final scene in the story sense), the listener cares and is shocked by what happens to them. Steven Foxton is a name I’m going to definitely keep an ear out for. This is his first time working as the music and sound director for a Big Finish production, and he does a smashing job with it. Vilag comes alive under his direction, with waves crashing on shore, a train rumbling through the countryside, crowds cheering their princess and running for their lives under an alien invasion, and tranquil flower gardens with gently flowing streams, and let’s not forget a Killoran attacking and strangling the Doctor! Gary Russell directs a fine story this time out, keeping everything moving at a quick pace and switching between scenes and points-of-view at just the right time. I appreciate a story that takes a risk. Arrangements for War could have easily been a one-not melodrama concerned with generating a few “feels” and leaving it at that. It goes way beyond, however, trying to show us a peek inside the Doctor’s mind and how he processes grief and allowing a companion confront him about it, all while giving the listener a gripping tale. It’s truly one of Big Finish’s crowning achievements, and all involved should take a well-deserved bow. Synopsis – Arrangements for War continues the story of Six and Evelyn with a well-crafted and emotional tale of love, politics, and alien invasion as Evelyn considers whether or not to end her travels with the Doctor. 5/5. Next up – On the morning of October 12th, 2021 Hex woke up. He was expecting to go to work at St Gart’s in London as normal and, that evening, have a great time in the bar of the White Rabbit, celebrating his 23rd birthday. Sylvester McCoy is the Doctor in…The Harvest. This entry was posted in Big Finish Review and tagged 5/5, Big Finish, Big Finish Review, Colin Baker, Doctor Who, Doctor Who Audio, Doctor Who Review, Evelyn Smythe, Maggie Stables, Sixth Doctor. Bookmark the permalink.